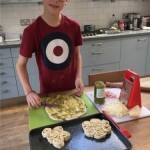 This is a guest post by my 12 year old son Fred! At school we were asked to adapt a basic bread recipe; our changes had to improve the sensory appeal, nutritional value and be suitable for a child’s packed lunch. 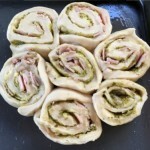 So I decided to add pesto, cheese and ham, a bit like a ready-made sandwich. It was so yummy that all my friends wanted to try it and I made it again today at home. What do you think? After making white bread dough I let it prove. Once proved I rolled it out into a large square. 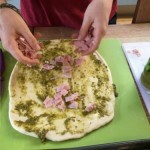 I then spread a thin layer of pesto over the dough. Then I added ham and cheese. I rolled it up and cut it into small swirls. 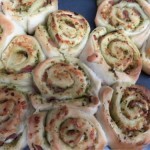 I placed on greased baking tray into small flowers of 7 swirls. The bread was then baked for around 10-20 minutes till golden brown. Here is the basic bread recipe that I adapted to make ‘Fred’s Bread’. Combine the flour and salt and rub in the butter. Mix the yeast and sugar into the water and milk. Make a well in the centre of the flour and add the liquid to it, mixing as you pour to form a dough. Knead on a floured surface for about 5-10 mins. Place the dough in a bowl and cover in cling film in a warm place until it doubles in size. Knead again and divide the mixture into 4-6 balls on a greased baking sheet. Sprinkle with flour and leave to rise once more for about 30 mins. Bake in a very hot oven around 220 degrees for about 15 minutes.